Mold Quality is a top priority at Platinum Tool Technologies. Utilizing a highly skilled workforce with more than 200 years of combined experience, and state-of-the-art software and equipment, we build the finest quality molds available. 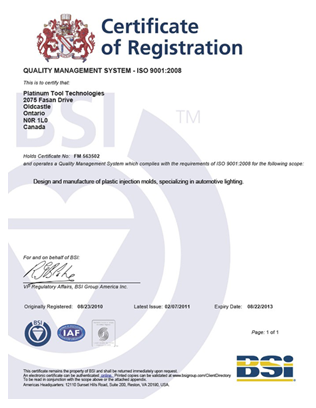 Platinum Tool goes far beyond its ISO 9001 quality certification. Our stringent quality requirements produce superior molds that exceed the industry standards for optic surfaces, along with A1 diamond finishes. We continuously strive to design and manufacturer superior products to those we created earlier, while reducing our cost and delivery time through our quality objectives. Contact us today to discuss your mold project needs.